Humans have the innate ability to control environments. The easiest example to pull out of the hat is the domestication of wild animals (dogs and horses). 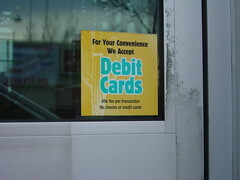 If we have this preference towards control, then why do authors suggest debit cards as the “solution” to credit cards? If you looked at the [purely factual] differences between the two, the undeniably clear winner would be credit. Of course, there are personal and behavioral influences that come into play. I’m only looking at a line-by-line comparison between the features of each. Second, the irony is that debit cards don’t actually curtail people from spending any less than they would normally. I’ve heard numerous stories of people incurring overdraft fees, REGULARLY. Still having less money than they would like at the end of the month, and worst of all, not being able to pinpoint what the charges were or why they went over. By no means is this an absolute, but as I see it the problem remains superficial solutions. Instead of focusing on the internal issue such as the user’s lack of discipline, a band-aid solution like “use debit cards” allows an author to address a problem while sidestepping any criticism. So despite the criticism I might draw, I want to try and address the heart of the matter: your discipline. People trade plastic, paper, and even their word to get what they want. If you’re unable to control yourself and say “no” once in a while – your plastic will be denied, you’ll have no more paper, and your word won’t be good anymore. However, I don’t want to trivialize the effort which discipline requires. I plan to expand upon this idea more in future posts (this may end up becoming a series), but for now let’s simply lay the foundation. When managing money, stick with the three C’s – Cash, Check, & Credit. The only D in your vocabulary should be Discipline, not Debit. For sure, discipline is key. Once you have the discipline to spend within your means, you’ve eliminated credit cards’ major drawback – the potential to get mired in high-interest debt. As long as you pay off your credit card balance in full every month, they confer some great benefits like transaction history, fraud-protection, cash-back, and the ability to make interest on your money while your CC co. fronts the bill. Yes yes and YES. People love free stuff, and credit cards offer exactly that! Float loan, car rental insurance, extended warranties, cash-back/rewards, exclusive card-only benefits (concert tickets). My grandmother NEVER uses cash. She pays for gallons of milk with her credit cards, but flies for free and even got a new car for MUCH less using points! The other benefit is SECURITY. Although debit cards offer some measures, they don’t even come close to the purchasing protection of credit cards.